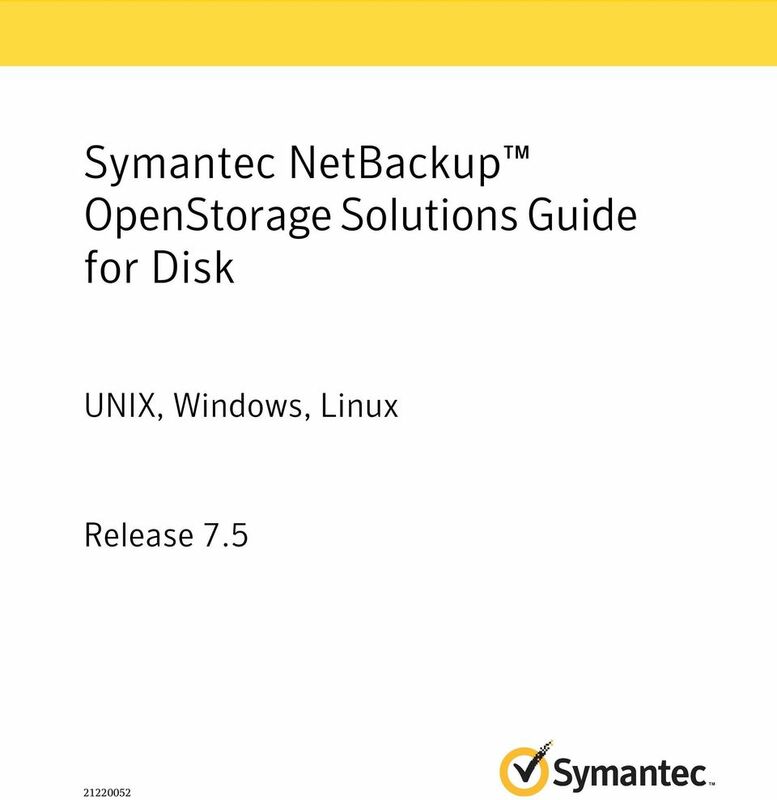 Download "Symantec NetBackup OpenStorage Solutions Guide for Disk"
2 Symantec NetBackup OpenStorage Solutions Guide for Disk The software described in this book is furnished under a license agreement and may be used only in accordance with the terms of the agreement. Documentation version: 7.5 PN: Legal Notice Copyright 2012 Symantec Corporation. All rights reserved. 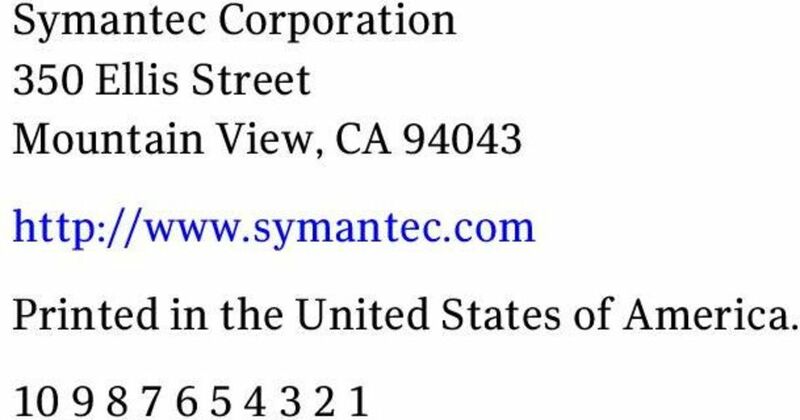 Symantec and the Symantec Logo, Veritas, and NetBackup are trademarks or registered trademarks of Symantec Corporation or its affiliates in the U.S. and other countries. Other names may be trademarks of their respective owners. This Symantec product may contain third party software for which Symantec is required to provide attribution to the third party ( Third Party Programs ). Some of the Third Party Programs are available under open source or free software licenses. The License Agreement accompanying the Software does not alter any rights or obligations you may have under those open source or free software licenses. Please see the Third Party Legal Notice Appendix to this Documentation or TPIP ReadMe File accompanying this Symantec product for more information on the Third Party Programs. The product described in this document is distributed under licenses restricting its use, copying, distribution, and decompilation/reverse engineering. No part of this document may be reproduced in any form by any means without prior written authorization of Symantec Corporation and its licensors, if any. THE DOCUMENTATION IS PROVIDED "AS IS" AND ALL EXPRESS OR IMPLIED CONDITIONS, REPRESENTATIONS AND WARRANTIES, INCLUDING ANY IMPLIED WARRANTY OF MERCHANTABILITY, FITNESS FOR A PARTICULAR PURPOSE OR NON-INFRINGEMENT, ARE DISCLAIMED, EXCEPT TO THE EXTENT THAT SUCH DISCLAIMERS ARE HELD TO BE LEGALLY INVALID. 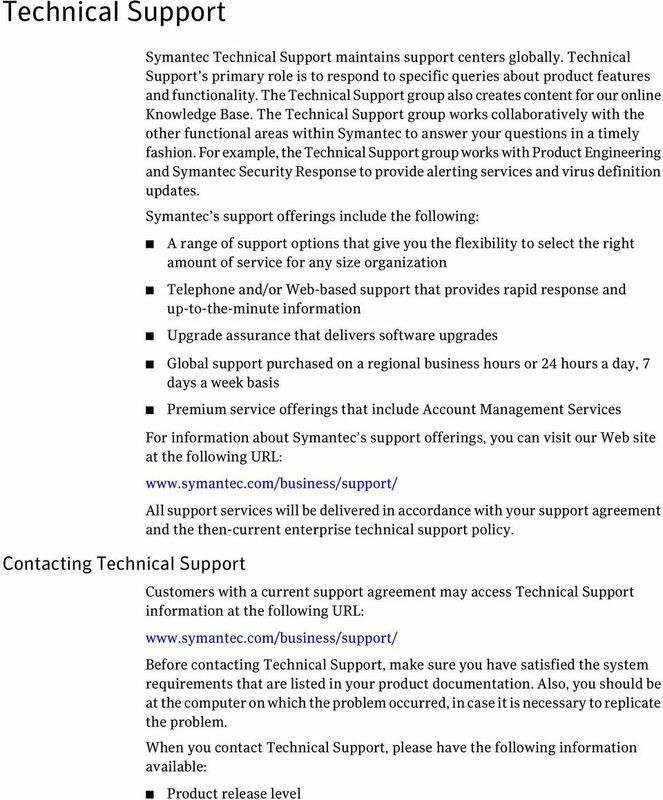 SYMANTEC CORPORATION SHALL NOT BE LIABLE FOR INCIDENTAL OR CONSEQUENTIAL DAMAGES IN CONNECTION WITH THE FURNISHING, PERFORMANCE, OR USE OF THIS DOCUMENTATION. THE INFORMATION CONTAINED IN THIS DOCUMENTATION IS SUBJECT TO CHANGE WITHOUT NOTICE. The Licensed Software and Documentation are deemed to be commercial computer software as defined in FAR and subject to restricted rights as defined in FAR Section "Commercial Computer Software - Restricted Rights" and DFARS , "Rights in Commercial Computer Software or Commercial Computer Software Documentation", as applicable, and any successor regulations. Any use, modification, reproduction release, performance, display or disclosure of the Licensed Software and Documentation by the U.S. Government shall be solely in accordance with the terms of this Agreement. 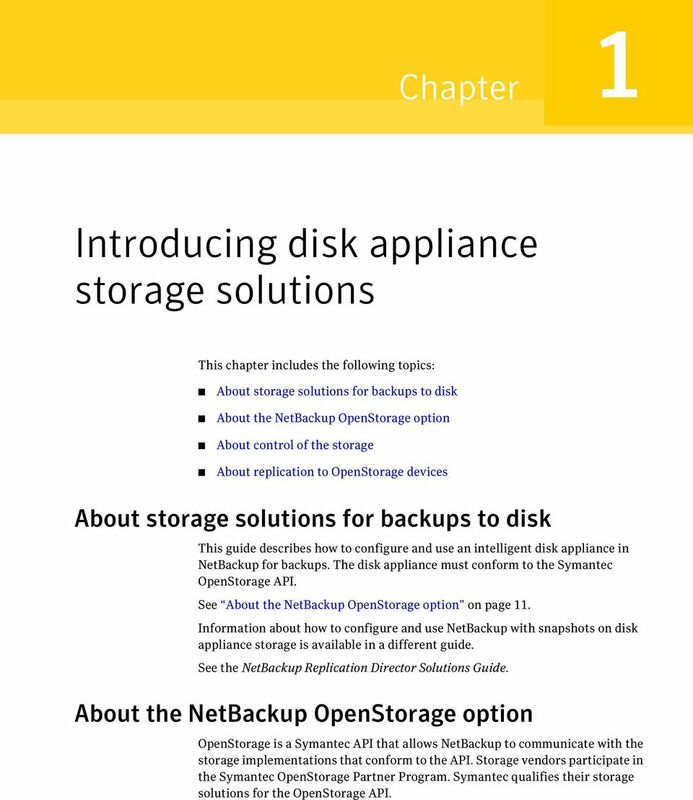 11 Chapter 1 Introducing disk appliance storage solutions This chapter includes the following topics: About storage solutions for backups to disk About the NetBackup OpenStorage option About control of the storage About replication to OpenStorage devices About storage solutions for backups to disk This guide describes how to configure and use an intelligent disk appliance in NetBackup for backups. The disk appliance must conform to the Symantec OpenStorage API. See About the NetBackup OpenStorage option on page 11. Information about how to configure and use NetBackup with snapshots on disk appliance storage is available in a different guide. See the NetBackup Replication Director Solutions Guide. About the NetBackup OpenStorage option OpenStorage is a Symantec API that allows NetBackup to communicate with the storage implementations that conform to the API. Storage vendors participate in the Symantec OpenStorage Partner Program. Symantec qualifies their storage solutions for the OpenStorage API. 12 12 Introducing disk appliance storage solutions About control of the storage Depending on the storage implementation, OpenStorage may provide the following capabilities: Share disks. Multiple heterogeneous media servers can access the same disk volume concurrently. Balance load and performance. NetBackup balances backup jobs and storage usage among the media servers and disk pools. For each backup job, NetBackup chooses the least full disk volume and least busy media server. Use of disk appliance capabilities, which may include optimized off-host duplication and deduplicated storage capabilities. Fast storage provisioning. Almost unlimited storage. Alternative to off-site vaulting. Simplified disaster recovery. Access your data from anywhere over the Internet. Figure 1-1 shows an OpenStorage configuration that uses a disk appliance. Figure 1-1 OpenStorage appliance configuration Load-balanced NetBackup media servers are data movers. They have the vendor plug-in installed. Network Any connectivity (directly attached, SAN, LAN) The disk appliance is the storage server. About control of the storage The vendor's storage implementation controls the storage format and where the images reside on the storage. The vendor controls the data transfer method. Consequently, performance and storage utilization are highly optimized. NetBackup has no knowledge of how the backup images are stored. Also, Symantec does not control which capabilities the vendor exposes through the OpenStorage API. Similarly, Symantec and NetBackup have no control over the communication between the vendor plug-in and the storage server. The vendor determines the API or protocol to use between the plug-in and the storage server. 13 Introducing disk appliance storage solutions About replication to OpenStorage devices 13 NetBackup determines when backup images are created, copied, or deleted. Images cannot be moved, expired, or deleted on the storage unless NetBackup instructs the appliance to do so through the API. About replication to OpenStorage devices NetBackup offers two types of replication to OpenStorage devices, as follows: Backups Replication of backups to another NetBackup domain is known as Auto Image Replicaton. Use this guide to configure Auto Image Replication of backups to an OpenStorage device. See About NetBackup Auto Image Replication on page 22. NetBackup deduplication also supports Auto Image Replication. See the NetBackup Deduplication Guide. Snapshots Snapshot replication within the same domain. Use this type to replicate snapshots from one OpenStorage device to the same device or to another device of the same vendor and type. See the NetBackup Replication Director Solutions Guide. 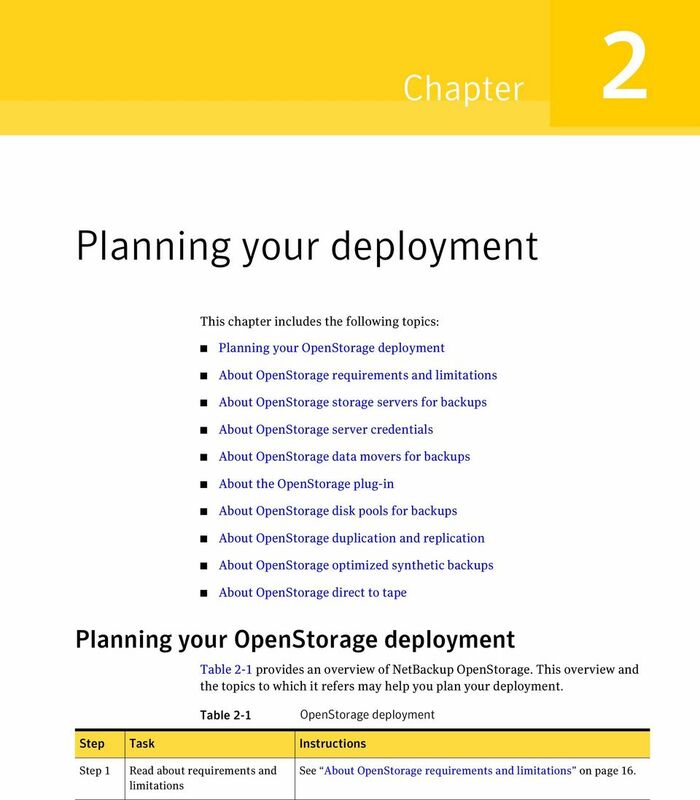 15 Chapter 2 Planning your deployment This chapter includes the following topics: Planning your OpenStorage deployment About OpenStorage requirements and limitations About OpenStorage storage servers for backups About OpenStorage server credentials About OpenStorage data movers for backups About the OpenStorage plug-in About OpenStorage disk pools for backups About OpenStorage duplication and replication About OpenStorage optimized synthetic backups About OpenStorage direct to tape Planning your OpenStorage deployment Table 2-1 provides an overview of NetBackup OpenStorage. This overview and the topics to which it refers may help you plan your deployment. 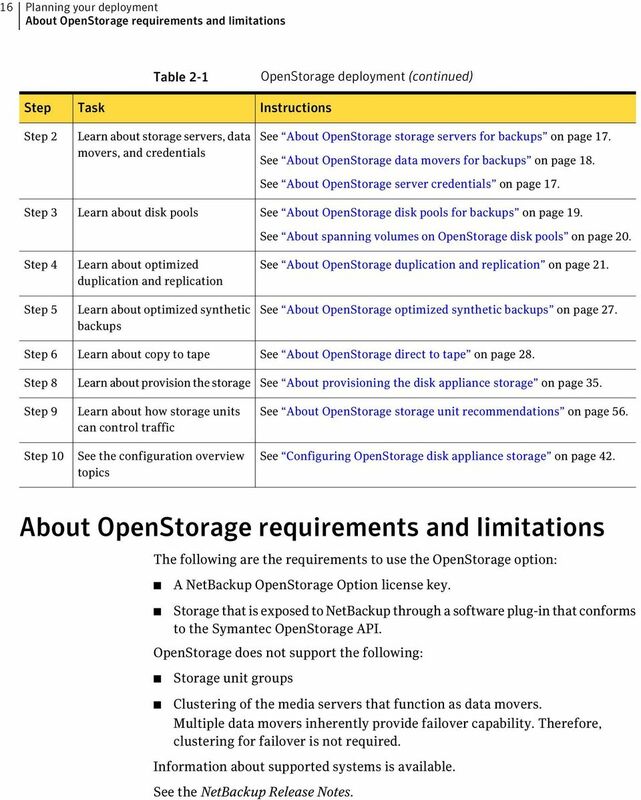 Table 2-1 OpenStorage deployment Step Step 1 Task Read about requirements and limitations Instructions See About OpenStorage requirements and limitations on page 16. 16 16 Planning your deployment About OpenStorage requirements and limitations Table 2-1 OpenStorage deployment (continued) Step Step 2 Step 3 Step 4 Step 5 Step 6 Step 8 Step 9 Step 10 Task Learn about storage servers, data movers, and credentials Learn about disk pools Learn about optimized duplication and replication Learn about optimized synthetic backups Learn about copy to tape Learn about provision the storage Learn about how storage units can control traffic See the configuration overview topics Instructions See About OpenStorage storage servers for backups on page 17. See About OpenStorage data movers for backups on page 18. See About OpenStorage server credentials on page 17. 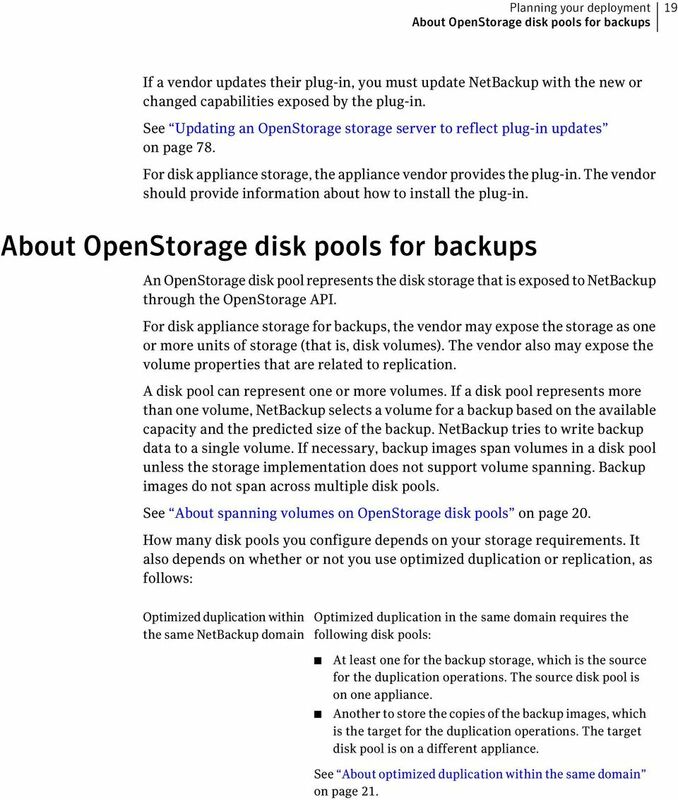 See About OpenStorage disk pools for backups on page 19. See About spanning volumes on OpenStorage disk pools on page 20. See About OpenStorage duplication and replication on page 21. See About OpenStorage optimized synthetic backups on page 27. See About OpenStorage direct to tape on page 28. See About provisioning the disk appliance storage on page 35. See About OpenStorage storage unit recommendations on page 56. 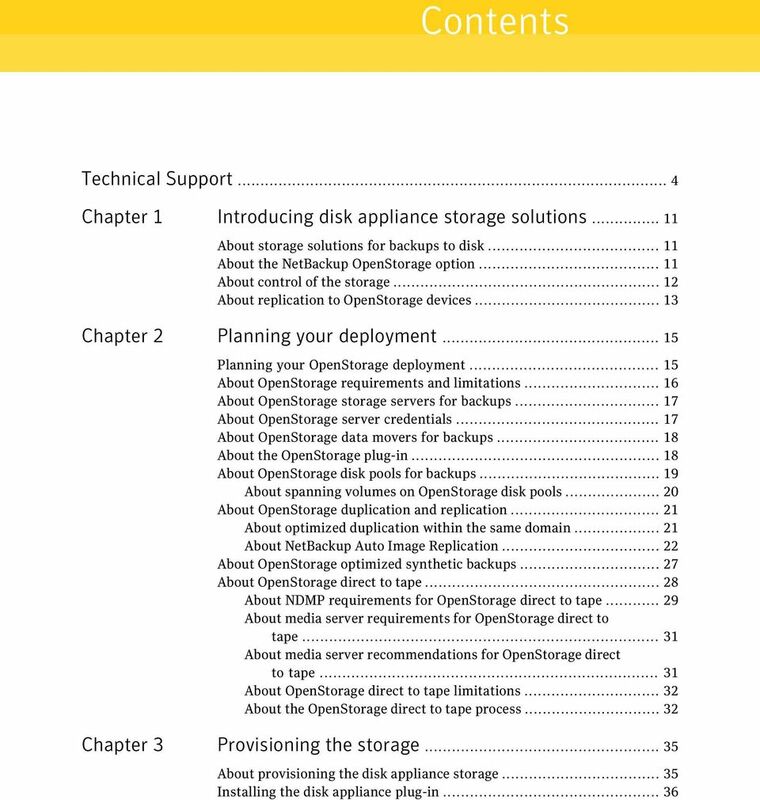 See Configuring OpenStorage disk appliance storage on page 42. About OpenStorage requirements and limitations The following are the requirements to use the OpenStorage option: A NetBackup OpenStorage Option license key. Storage that is exposed to NetBackup through a software plug-in that conforms to the Symantec OpenStorage API. OpenStorage does not support the following: Storage unit groups Clustering of the media servers that function as data movers. Multiple data movers inherently provide failover capability. Therefore, clustering for failover is not required. Information about supported systems is available. See the NetBackup Release Notes. 18 18 Planning your deployment About OpenStorage data movers for backups Saves the credentials so the media servers can log into the storage server. If the storage server is also an NDMP FSE host for direct to tape operations, they both must have the same logon credentials. See About OpenStorage direct to tape on page 28. Configures each media server you select as a data mover. NetBackup does not monitor connectivity between data movers and the storage server. However, when you configure the credentials, NetBackup configures and maintains an access path between the media server and the storage server. See About OpenStorage data movers for backups on page 18. If the storage server does not require logon credentials, you must enter dummy credentials so that NetBackup configures the media servers as data movers. About OpenStorage data movers for backups A data mover is a NetBackup media server that backs up a client and then transfers the data to a storage server. The storage server then writes the data to storage. A data mover also can move data back to primary storage (the client) during restores and from secondary storage to tertiary storage during duplication. The data movers host a software plug-in they use to communicate with the storage implementation. When you configure the storage server, you also select the media servers that host the OpenStorage plug-in. Those media server data movers are assigned the credentials for the storage server. The credentials allow the data movers to communicate with the storage server. NetBackup then configures the media servers as data movers. You can control which data movers are used for backups and duplications when you configure NetBackup storage units. See About OpenStorage storage servers for backups on page 17. About the OpenStorage plug-in A software plug-in must reside on every NetBackup media server that moves backup data to the storage server. The plug-in must conform to the Symantec OpenStorage API specification. The vendor exposes the storage capabilities to NetBackup through the plug-in. To determine a disk appliance s capabilities, NetBackup uses the plug-in to query the storage appliance. Capabilities can include deduplicated storage, optimized off-host duplication, and so on. 19 Planning your deployment About OpenStorage disk pools for backups 19 If a vendor updates their plug-in, you must update NetBackup with the new or changed capabilities exposed by the plug-in. See Updating an OpenStorage storage server to reflect plug-in updates on page 78. For disk appliance storage, the appliance vendor provides the plug-in. The vendor should provide information about how to install the plug-in. About OpenStorage disk pools for backups An OpenStorage disk pool represents the disk storage that is exposed to NetBackup through the OpenStorage API. For disk appliance storage for backups, the vendor may expose the storage as one or more units of storage (that is, disk volumes). The vendor also may expose the volume properties that are related to replication. A disk pool can represent one or more volumes. If a disk pool represents more than one volume, NetBackup selects a volume for a backup based on the available capacity and the predicted size of the backup. NetBackup tries to write backup data to a single volume. If necessary, backup images span volumes in a disk pool unless the storage implementation does not support volume spanning. Backup images do not span across multiple disk pools. See About spanning volumes on OpenStorage disk pools on page 20. How many disk pools you configure depends on your storage requirements. It also depends on whether or not you use optimized duplication or replication, as follows: Optimized duplication within the same NetBackup domain Optimized duplication in the same domain requires the following disk pools: At least one for the backup storage, which is the source for the duplication operations. The source disk pool is on one appliance. Another to store the copies of the backup images, which is the target for the duplication operations. The target disk pool is on a different appliance. See About optimized duplication within the same domain on page 21. 22 22 Planning your deployment About OpenStorage duplication and replication Reduced workload on the NetBackup media servers. More backups can be performed. Faster duplication. Duplication can occur in the background, simultaneously with ongoing backup jobs. Reduced bandwidth. If the appliance supports deduplication, the copy process may send only changed blocks. The requirements and limitations of optimized duplication with the same domain are as follows: Optimized duplication requirements Optimized duplication limitations The vendor must expose the off-host data movement capability in their plug-in. Both the source and the destination disk pools must be the same OpenStorage vendor type. One or more NetBackup media servers must connect to the source appliance and the destination appliance. If the optimized duplication fails, the job is not retried. To configure NetBackup to do normal duplication if the optimized job fails, add the following entry to the bp.conf file on the NetBackup master server: RESUME_ORIG_DUP_ON_OPT_DUP_FAIL = TRUE The copy operation uses the maximum fragment size of the source storage unit, not the setting for the destination storage unit. The optimized duplication copies the image fragments as is. For greater efficiency, the duplication does not resize and reshuffle the images into a different set of fragments on the destination storage unit. To confirm the image copy, a media server must have connectivity to the destination appliance. A storage unit group cannot be a destination for optimized duplication. The destination must be a storage unit that represents an OpenStorage appliance of the same type as the source appliance. See Configuring OpenStorage optimized duplication within the same domain on page 69. About NetBackup Auto Image Replication If your storage vendor's product supports replication, you can automatically replicate backup images to a similar device in a different master server domain. This process is referred to as Auto Image Replication. 24 24 Planning your deployment About OpenStorage duplication and replication Event 4 Table 2-3 Domain in which event occurs Target master (Domain 2) Auto Image Replication process overview (continued) Event description After the image is imported into the target domain, NetBackup continues to manage the copies in that domain. Depending on the configuration, the media server in Domain 2 can replicate the images to a media server in Domain 3. About the domain relationship For OpenStorage and Auto Image Replication, the originating NetBackup domain has no knowledge of the storage server in the target domain. The relationship between the originating domain and the target domain is configured using the disk appliance vendor's tools. When the appliances are configured properly, NetBackup images on the originating disk appliance are replicated automatically to the target disk appliance. That disk appliance uses the OpenStorage API to notify NetBackup that a replication event occurred. NetBackup then imports those images. See About the replication topology for Auto Image Replication on page 45. Caution: Choose the target storage server or servers carefully. A target storage server must not also be a storage server for the originating domain. One-to-many Auto Image Replication model In this configuration, all copies are made in parallel. The copies are made within the context of one NetBackup job and simultaneously within the originating storage server context. If one target storage server fails, the entire job fails and is retried later. All copies have the same Target Retention. To achieve different Target Retention settings in each target master server domain, either create multiple source copies or cascade duplication to target master servers. Cascading Auto Image Replication model Replications can be cascaded from the originating domain to multiple domains. To do so, storage lifecycle policies are set up in each domain to anticipate the originating image, import it and then replicate it to the next target master. Figure 2-2 represents the following cascading configuration across three domains. The image is created in Domain 1, and then replicated to the target Domain 2. 25 Planning your deployment About OpenStorage duplication and replication 25 The image is imported in Domain 2, and then replicated to a target Domain 3. The image is then imported into Domain 3. Figure 2-2 Cascading Auto Image Replication Domain 1 SLP (D1toD2toD3) Backup Replication to target master Domain 2 Import All copies have the same Target retention, as indicated in Domain 1. SLP (D1toD2toD3) Import Replication to target server Import Domain 3 SLP (D1toD2toD3) Import Duplication to local storage In the cascading model, the originating master server for Domain 2 and Domain 3 is the master server in Domain 1. Note: When the image is replicated in Domain 3, the replication notification event initially indicates that the master server in Domain 2 is the originating master server. However, when the image is successfully imported into Domain 3, this information is updated to correctly indicate that the originating master server is in Domain 1. The cascading model presents a special case for the Import SLP that will replicate the imported copy to a target master. (This is the master server that is neither the first nor the last in the string of target master servers.) As discussed previously, the requirements for an Import SLP include at least one operation that uses a Fixed retention type and at least one operation that uses a Target Retention type. So that the Import SLP can satisfy these requirements, the import operation must use a Target Retention. Table 2-4 shows the difference in the import operation setup. 26 26 Planning your deployment About OpenStorage duplication and replication Table 2-4 Import operation difference in an SLP configured to replicate the imported copy Import operation criteria The first operation must be an import operation. A replication to target master must use a Fixed retention type At least one operation must use the Target retention. Import operation in a cascading model Same; no difference. Same; no difference. Here is the difference: To meet the criteria, the import operation must use Target retention. The target retention is embedded in the source image. Because the imported copy is the copy being replicated to a target master server domain, the fixed retention (three weeks in this example) on the replication to target master operation is ignored. The target retention is used instead. 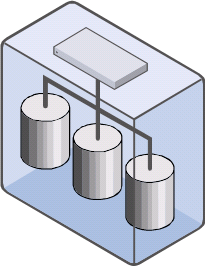 (See Figure 2-3.) Figure 2-3 Storage lifecycle policy configured to replicate the imported copy Target retention of source image Replication goes to another domain In the cascading model that is represented in Figure 2-2, all copies have the same Target Retention the Target Retention indicated in Domain 1. For the copy in Domain 3 to have a different target retention, add an intermediary replication operation to the Domain 2 storage lifecycle policy. The intermediary replication operation acts as the source for the replication to target master. Since the target retention is embedded in the source image, the copy in Domain 3 honors the retention level that is set for the intermediary replication operation. 27 Planning your deployment About OpenStorage optimized synthetic backups 27 Figure 2-4 Cascading replications to target master servers, with various target retentions Domain 1 SLP (D1toD2toD3) Backup Replication to target master Domain 2 Import SLP (D1toD2toD3) Import Duplication Replication to target master Domain 3 The copy in Domain 3 has the retention indicated by the source replication in Domain 2. Import SLP (D1toD2toD3) Import Duplication About OpenStorage optimized synthetic backups One of the capabilities a vendor may expose is the disk appliance's potential to construct synthetic backup images. A media server uses messages to instruct the storage server which full and incremental backup images to use when creating the synthetic backup. The storage server constructs (or synthesizes) the backup image directly on the disk storage. In NetBackup, backups created in this way are known as optimized synthetic backups. The OpenStorage optimized synthetic backup method provides the following benefits: Faster than a synthetic backup. 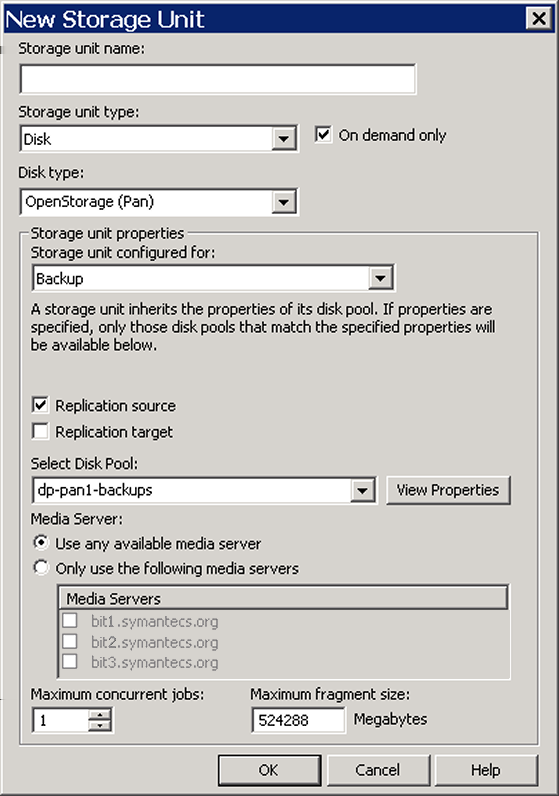 Regular synthetic backups are constructed on the media server. They are moved across the network from the storage server to the media server and synthesized into one image. The synthetic image is then moved back to the storage server. Requires no data movement across the network. Regular synthetic backups use network traffic. Uses fewer disk resources, depending on the vendor implementation. The storage vendor determines the storage implementation. If the disk appliance uses data deduplication, duplicate data is not created and stored. 28 28 Planning your deployment About OpenStorage direct to tape In NetBackup, the Optimizedlmage attribute enables optimized synthetic backup. It applies to both storage servers and disk pools. If the original vendor plug-in exposed optimized synthetic backup functionality, the storage server and disk pools inherited that functionality. However, if your OpenStorage vendor updates their plug-in to add optimized synthetic backup functionality, you have to update NetBackup. See Adding OpenStorage functionality to an existing environment on page 73. The following are the requirements for optimized synthetic backups: The master and the media servers are at NetBackup version or later. The Enterprise Disk license key is installed on the NetBackup master server. The plug-in from the disk appliance vendor supports the OpenStorage OptimizedImage attribute. The vendor plug-in is installed on each media server that connects to the storage appliance. The target storage unit's disk pool is the same disk pool on which the source images reside. About OpenStorage direct to tape OpenStorage direct to tape lets you copy NetBackup backup images directly from a disk appliance to tape. The copy operation does not use NetBackup media server I/O. NetBackup manages the copied images based on retention periods you define. Direct to tape uses the Network Data Management Protocol (NDMP) for the copy operations. Direct to tape requires specific NDMP features and release levels. See About NDMP requirements for OpenStorage direct to tape on page 29. NetBackup media servers manage the operations. The media servers require the NetBackup for NDMP software and specific NetBackup release levels. See About media server requirements for OpenStorage direct to tape on page 31. How to configure OpenStorage direct to tape is described elsewhere. See Configuring OpenStorage direct to tape on page 71. 29 Planning your deployment About OpenStorage direct to tape 29 About NDMP requirements for OpenStorage direct to tape If the NDMP requirements are not met, the images are still duplicated. However, the copy operation uses the traditional duplication method of reading the image through the NetBackup media server and writing out to tape. Table 2-5 NDMP requirements for OpenStorage direct to tape NDMP functionality NDMP File Service Extension Description The OpenStorage disk appliance requires an NDMP server that supports the OpenStorage direct to tape specification. The Symantec OpenStorage Partner Program publishes the specification. The direct to tape feature uses a subset of the NDMP File Service Extension (FSE) commands. The host that provides the NDMP FSE functionality can be one of the following entities: The disk appliance storage server. See About OpenStorage storage servers for backups on page 17. An alternative name (that is, interface) for the storage server. A separate host that interacts with the disk appliance. The host must be directly connected to the disk appliance. NDMP tape server Direct to tape requires an NDMP tape server for the destination tape library. The NDMP tape server must support NDMP v4 or later. The host that provides the NDMP tape server functionality can be one of the following entities: The same host that provides the NDMP FSE functionality. If one host provides the NDMP FSE and NDMP tape server functionality, the tape library must be attached directly to that host. Data does not travel over the network. See Figure 2-5 on page 30. A host that is embedded in the tape library. Data travels over the network. See Figure 2-6 on page 30. A separate host to which the tape server is directly attached. Data travels over the network. See Figure 2-7 on page 30. Credentials The NDMP FSE server must use the same credentials as the OpenStorage storage server. If you use the NDMP FSE server for other purposes, do not configure the credentials differently for that purpose. For example, if you also use the NDMP FSE server as a VTL with NetBackup, use the same credentials when you configure it with NetBackup. 31 Planning your deployment About OpenStorage direct to tape 31 About media server requirements for OpenStorage direct to tape Although NetBackup media servers do not provide I/O, they are used to manage the operations. Table 2-6 Media server requirements for OpenStorage direct to tape Media server function Read side media server Description In this context, the read side media server does not read or move the backup images. It manages the read side of the NDMP copy operation. The read side media server requires the following: NetBackup or later. The NetBackup for NDMP software. Logon credentials for the disk appliance storage server and the NDMP FSE host. If the NDMP FSE host and the storage server host have the same name, NetBackup uses the storage server credentials to logon to the NDMP host. Therefore, you do not have to configure NDMP credentials in NetBackup. This NetBackup behavior means that the credentials you create for the disk appliance storage server and the NDMP FSE host must be the same. If the NDMP FSE hostname is different than the storage server hostname, you must configure logon credentials in NetBackup for that NDMP host. Write side media server In this context, the write side media server does not move or write the backup images. It manages the write side of the NDMP copy operation. The write side media server requires the following: NetBackup 6.5 or later. The NetBackup for NDMP software. Logon credentials for the NDMP tape server host. If one host provides both NDMP FSE and NDMP tape server functionality, one media server functions as both the read and write server. About media server recommendations for OpenStorage direct to tape To simplify OpenStorage configuration and management, Symantec recommends that you use one set of media servers for all OpenStorage activity. The media servers then can function as either read or write side servers for direct to tape operations. They also can function as data movers for other OpenStorage operations. For each media server in the set, do the following: Configure logon credentials to the OpenStorage storage server. 32 32 Planning your deployment About OpenStorage direct to tape Install the NetBackup for NDMP software. Configure logon credentials for the NDMP FSE host (if required). Configure logon credentials for the NDMP tape server host. 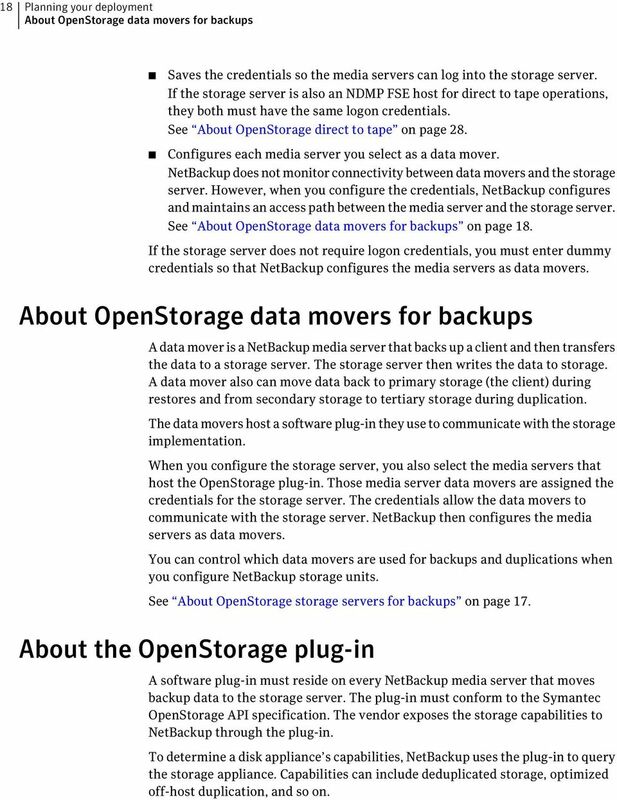 See About OpenStorage data movers for backups on page 18. About OpenStorage direct to tape limitations The following limitations exist: The destination storage unit must be NDMP. You cannot use a storage unit group. You cannot make multiple copies with one copy operation. Backup images are not multiplexed when written to tape. About the OpenStorage direct to tape process The following is an overview of the direct copy to tape process: NetBackup verifies that the image to be duplicated resides on an OpenStorage device. NetBackup verifies that the disk appliance NDMP host supports the OpenStorage direct to tape specification. NetBackup selects the write side media server, a destination tape drive, and a tape volume. NetBackup selects a media server that has credentials to the NDMP tape server host. The media servers NetBackup considers are listed in the destination storage unit. The write side media server does the following: Establishes an NDMP session with the NDMP tape server and confirms that it supports the NDMP v4 protocol. Mounts, opens, and positions the tape and then uses NDMP to write a header to the tape. Sets up the NDMP mover interface on the NDMP tape server. It also monitors the progress of the write operation by waiting for any NDMP notifications. NetBackup selects the read side media server. If the write side media server has credentials for the NDMP FSE host, NetBackup selects it as the read side server. If it does not have credentials, NetBackup selects a media server with credentials to the NDMP FSE host. 33 Planning your deployment About OpenStorage direct to tape 33 The read side media server does the following: Establishes an NDMP session with the NDMP FSE host. Opens the files to be copied. Sets up the NDMP mover interface on the NDMP FSE host. It also monitors the progress of the read operation by waiting for any NDMP notifications. By means of the NDMP protocol, the backup images on the disk appliance are copied to the tape storage. After the images are copied, the read and write media servers close their connections to their respective NDMP hosts. NetBackup validates the image copies; if valid, NetBackup ends the duplication job with status 0 (success). 36 36 Provisioning the storage Installing the disk appliance plug-in Optimized duplication within the same NetBackup domain You must provision at least two appliances: One appliance for the backups, which is the source for the duplication operations. Another appliance for the copies of the backup images, which is the target for the duplication operations. See About optimized duplication within the same domain on page 21. Auto Image Replication to a different NetBackup domain You must provision at least two appliances: One appliance for the backups in the originating domain. This is the appliance on which NetBackup stores your client backups. It is the source for the duplication operations. Another appliance in the remote domain for the copies of the backup images. This appliance is the target for the duplication operations that run in the originating domain. 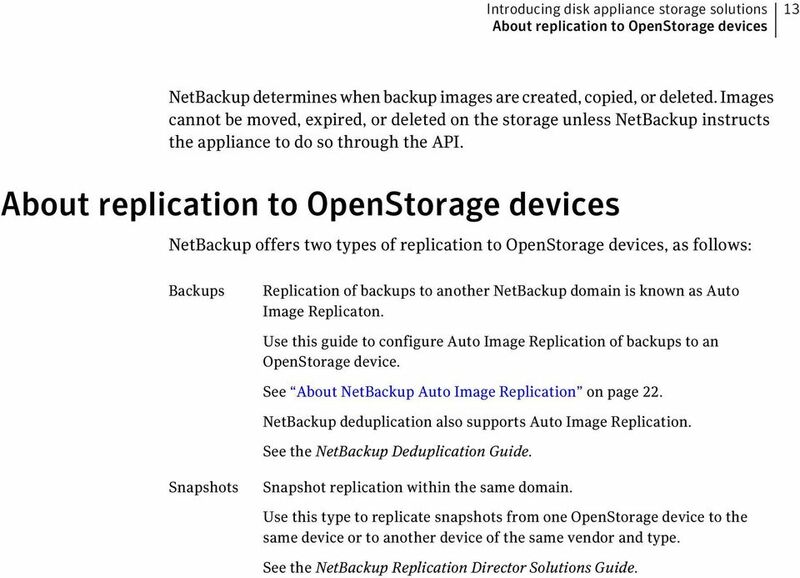 See About NetBackup Auto Image Replication on page 22. Instructions for how to install and configure the appliance are beyond the scope of the NetBackup documentation. For instructions, refer to the vendor documentation. Installing the disk appliance plug-in If your storage is a disk appliance, the storage vendor s release package includes a plug-in to communicate with NetBackup. The plug-in installs on the NetBackup media servers that connect to the storage server. Table 3-1 To install the disk appliance plug-in Step 1 Task Install the plug-in on all NetBackup media servers that connect to the appliance. Procedure See the vendor s installation instructions. The vendor s plug-in installation process may also configure the storage server. See Configuring an OpenStorage storage server for backups on page Restart the NetBackup Remote Manager and Monitor Service on each media server on which you install the plug-in. See the NetBackup Administrator's Guide for your operating system. 37 Provisioning the storage Installing the disk appliance plug-in 37 After the installation of the plug-in, newly created storage servers and disk pools inherit all of the functionality that the vendor exposes in their plug-in. However, if the vendor updates the plug-in to add new functionality, you must update existing storage servers and disk pools to use that new functionality. See Updating an OpenStorage storage server to reflect plug-in updates on page 78. Vendor plug-ins must be 64-bit except for Windows Server 2008 R2, which may be 32-bit. See Adding OpenStorage functionality to an existing environment on page 73. 39 Chapter 4 Licensing OpenStorage This chapter includes the following topics: About the OpenStorage license key Licensing OpenStorage About the OpenStorage license key OpenStorage is a feature that is licensed separately from base NetBackup. The NetBackup OpenStorage Disk Option license activates OpenStorage. The NetBackup OpenStorage Disk Option license also activates the NetBackup for NDMP software, which is used for the direct to tape feature. You must install the NetBackup for NDMP software on the media servers that you use for direct to tape. You also must enter the license key on those media servers. Enter the license key on the master server and on each media server that connects to the disk appliance. You may have a single license key that activates both NetBackup and the OpenStorage Disk Option. Alternatively, you may have one license key that activates NetBackup and another key that activates the OpenStorage Disk Option. See Licensing OpenStorage on page 40. The license key only enables the NetBackup functionality. You must purchase a storage vendor s product and install the storage vendor s NetBackup plug-in. If you remove the OpenStorage Disk Option license key or if it expires, the following restrictions apply: You cannot create the disk pools or the storage units that use the disk pools. NetBackup jobs fail that attempt to use the disk pools or the storage units that are based on the disk pools. The error message indicates that the feature is not licensed. 40 40 Licensing OpenStorage Licensing OpenStorage NetBackup does not delete the disk pools or the storage units that are based on the disk pools. You can use them again if you enter a valid license key. Licensing OpenStorage No special installation is required for the NetBackup components of OpenStorage. However, you must enter a license key. The following procedure describes how to use the NetBackup Administration Console to enter the license key. Note: Enter the license key on the NetBackup master server and on each media server that connects to the disk appliance. If you use the direct to tape feature, also enter the license key on each NetBackup media server that you use for direct to tape. Those media servers also must have the NetBackup for NDMP software installed. The license key that activates OpenStorage also activates the NDMP software on the media servers. See About OpenStorage direct to tape on page 28. To license OpenStorage 1 To add a license to a specific server, select File > Change Server and then select the server. 2 In the NetBackup License Keys dialog box, click New. 3 In the Add a New License Key dialog box, enter the license key and click Add or OK. 4 Click Close. 5 Restart all the NetBackup services and daemons. 42 42 Configuring OpenStorage in NetBackup Configuring OpenStorage disk appliance storage Setting NetBackup configuration options by using bpsetconfig Configuring OpenStorage disk appliance storage Table 5-1 describes the tasks to configure NetBackup to use a third-party vendor's disk appliance that conforms to the Symantec OpenStorage API. The NetBackup administrator's guides describe how to configure a base NetBackup environment. See the NetBackup Administrator's Guide for Windows, Volume I. See the NetBackup Administrator's Guide for UNIX and Linux, Volume I. Table 5-1 OpenStorage disk appliance configuration tasks Step Step 1 Step 2 Step 3 Step 4 Step 5 Step 6 Task Learn about planning your deployment Enable legacy logging Provision the storage and install the plug-in Configure one or more storage servers Configure disk pools Configure storage units Instructions See Planning your OpenStorage deployment on page 15. See Creating NetBackup log file directories on page 44. How many devices you provision depends on your storage requirements. It also depends on whether or not you use optimized duplication or replication. See About NetBackup Auto Image Replication on page 22. See About provisioning the disk appliance storage on page 35. See Installing the disk appliance plug-in on page 36. How many storage servers you configure depends on your storage requirements. It also depends on whether or not you use optimized duplication or replication. See About OpenStorage storage servers for backups on page 17. See Configuring an OpenStorage storage server for backups on page 44. How many disk pools you configure depends on your storage requirements. It also depends on whether or not you use optimized duplication or replication. See About the replication topology for Auto Image Replication on page 45. See Viewing the replication topology for Auto Image Replication on page 46. See Configuring an OpenStorage disk pool for backups on page 50. See Configuring an OpenStorage storage unit on page 51. 43 Configuring OpenStorage in NetBackup Configuring OpenStorage disk appliance storage 43 Table 5-1 OpenStorage disk appliance configuration tasks (continued) Step Step 7 Step 8 Task Configure optimized duplication Configure a storage lifecycle policy for replication Instructions Optimized duplication is optional. See Configuring OpenStorage optimized duplication within the same domain on page 69. 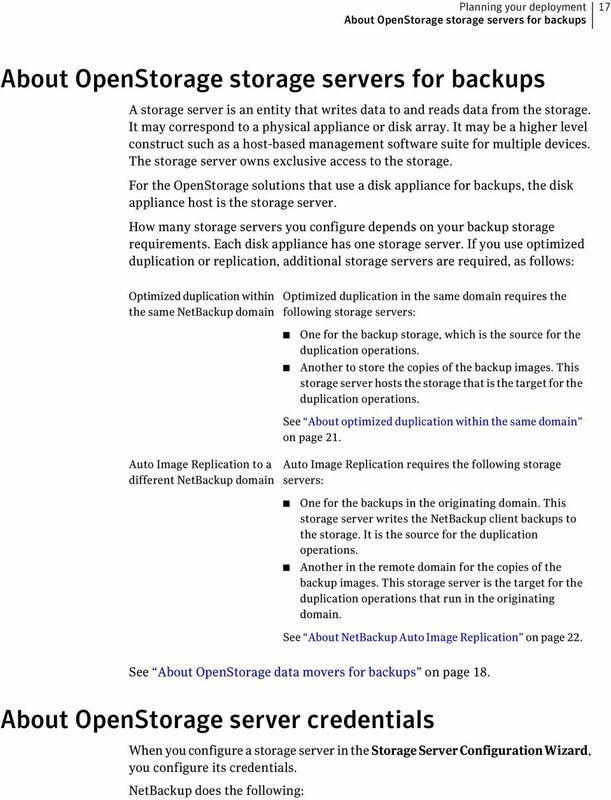 See Configuring OpenStorage optimized duplication behavior on page 68. Replication is optional. To replicate images from one NetBackup domain to another, configure a pair of storage lifecycle policies; one in each master server domain. The storage lifecycle policy pair includes the following: An SLP in the originating domain that contains a replication destination to a target master. (The Auto Image Replication SLP.) An SLP in the target domain that contains an import destination. (The Import SLP.) Step 9 Step 10 Step 11 Create a backup policy Configure copy to tape Configure optimized synthetic backups The following topic describes how the SLPs must be named and the storage destinations and retention type that each SLP must contain. See About the storage lifecycle policies required for Auto Image Replication on page 58. See Creating a storage lifecycle policy on page 62. To replicate images from one NetBackup domain to another, a backup policy in the source domain must indicate the configured SLP as the Policystorage selection. See Creating a policy using the Policy Configuration Wizard on page 67. See Creating a policy without using the Policy Configuration Wizard on page 67. Copy to tape is optional. See About OpenStorage direct to tape on page 28. See Configuring OpenStorage direct to tape on page 71. Optimized synthetic backups are optional. See Configuring OpenStorage optimized synthetic backups on page 73. 44 44 Configuring OpenStorage in NetBackup Creating NetBackup log file directories Creating NetBackup log file directories Before you configure OpenStorage, create the directories into which NetBackup commands write log files. Create the directories on the master server and on each media server that you use for OpenStorage. More information about NetBackup logging is available. See the NetBackup Troubleshooting Guide. See About OpenStorage log files on page 99. To create log directories for NetBackup commands Depending on the operating system, run one of the following scripts: UNIX: /usr/openv/netbackup/logs/mklogdir Windows:install_path\NetBackup\logs\mklogdir.bat To create the tpconfig command log directory Depending on the operating system, create the debug directory and the tpcommand directory (by default, the debug directory and the tpcommand directory do not exist). After you create the directories, the pathnames are as follows: UNIX: /usr/openv/volmgr/debug/tpcommand Windows: install_path\volmgr\debug\tpcommand Configuring an OpenStorage storage server for backups Configure in this context means to add the storage host to NetBackup as a storage server. When you configure a storage server, you also configure the media servers that function as data movers. If the storage host does not require logon credentials, you must enter dummy credentials so that NetBackup configures the media servers as data movers. To configure an OpenStorage storage server in NetBackup 1 In the NetBackup Administration Console, in the left pane, click Media and Device Management. 2 In the right pane, select Configure Disk Storage Servers. 3 Follow the wizard screens to configure a storage server. 45 Configuring OpenStorage in NetBackup About the replication topology for Auto Image Replication 45 About the replication topology for Auto Image Replication The disk volumes of the devices that support Auto Image Replication have the properties that define the replication relationships between the volumes. The knowledge of the volume properties is considered the replication topology. The following are the replication properties that a volume can have: Source Target None A source volume contains the backups of your clients. The volume is the source for the images that are replicated to a remote NetBackup domain. Each source volume in an originating domain has one or more replication partner target volumes in a target domain. A target volume in the remote domain is the replication partner of a source volume in the originating domain. The volume does not have a replication attribute. If your OpenStorage vendor's devices support replication, your storage administrator configures the replication topology of the volumes in the storage devices. Based on the volume properties, you create homogeneous disk pools. That is, all of the volumes in a disk pool must have the same properties, and you create the disk pools to match that topology. The disk pools inherit the replication properties from the volumes that you add to them. You should work with your storage administrator to understand the topology so you can create the proper disk pools. You also should work with your storage administrator to understand any changes that are made to the replication topology. NetBackup discovers the topology of the volumes when you configure a disk pool. NetBackup discovers topology changes when you use the Refresh option of the Change Disk Pool dialog box. See Changing OpenStorage disk pool properties on page 85. NetBackup includes a command that can help you understand your replication topology. Use the command in the following situations: After you configure the storage server and before you configure disk pools. After changes to the volumes that comprise the storage. See Viewing the replication topology for Auto Image Replication on page 46. 46 46 Configuring OpenStorage in NetBackup Viewing the replication topology for Auto Image Replication Viewing the replication topology for Auto Image Replication For a replication operation to succeed, a volume that is a source of replication must have at least one replication partner that is the target of replication. NetBackup lets you view the replication topology of the storage. See About the replication topology for Auto Image Replication on page 45. To view the replication topology for Auto Image Replication Run the bpstsinfo command, specifying the storage server name and the server type. The following is the command syntax: bpstsinfo -lsuinfo -storage_server storage_server_name -stype server_type The command is located in the following directory: UNIX: /usr/openv/netbackup/bin/admincmd/ Windows: Install_path\NetBackup\bin\admincmd\ The following are the options and arguments for the command: -storage_server storage_server_name -stype server_type The name of the storage server. For an OpenStorage disk appliance, the vendor provides the string for server_type. Save the output to a file so that you can compare the current topology with the previous topology to determine what has changed. Example output is available. See Sample volume properties output for OpenStorage backup replication on page 46. Sample volume properties output for OpenStorage backup replication The following examples show sample output from the bpstsinfo command for two OpenStorage devices. The first example is the output from the source disk pool that contains the client backups. The second example is from the target disk pool in the remote master server domain. The two examples show the following: Volume dv01 on storage server pan1 is the replication source for volume dv01 on pan2. 50 50 Configuring OpenStorage in NetBackup Configuring an OpenStorage disk pool for backups Configuring an OpenStorage disk pool for backups When you create a disk pool, you specify the following: The storage server. For OpenStorage, the disk appliance is the storage server. The disk volume or volumes to include in the pool. The disk pool properties. See OpenStorage disk pool properties on page 50. Symantec recommends that disk volume and disk pool names be unique across your enterprise. See Configuring an OpenStorage storage server for backups on page 44. To configure an OpenStorage disk pool 1 In the NetBackup Administration Console, in the left pane, select Media and Device Management. 2 From the list of wizards in the right pane, click Configure Disk Pool and follow the wizard instructions. OpenStorage disk pool properties The properties of an OpenStorage disk pool may vary depending on the purpose the disk pool. The following table describes the possible properties: Table 5-2 OpenStorage disk pool properties Property Name Storage server Description The disk pool name. The storage server name. For disk appliance storage, the storage server is the disk appliance host. Replication source Replication target Disk volumes Total size Total raw size Indicates that the disk pool is a source for replication. Indicates that the disk pool is a target for replication. For disk appliance storage, the disk volumes that comprise the disk pool. The total amount of space available in the disk pool. The total raw, unformatted size of the storage in the disk pool. The storage host may or may not expose the raw size of the storage. 51 Configuring OpenStorage in NetBackup Configuring an OpenStorage storage unit 51 Table 5-2 OpenStorage disk pool properties (continued) Property Comment High water mark Description A comment that is associated with the disk pool. The High water mark setting is a threshold that triggers the following actions: When an individual volume in the disk pool reaches the High water mark, NetBackup considers the volume full. NetBackupchooses a different volume in the disk pool to write backup images to. 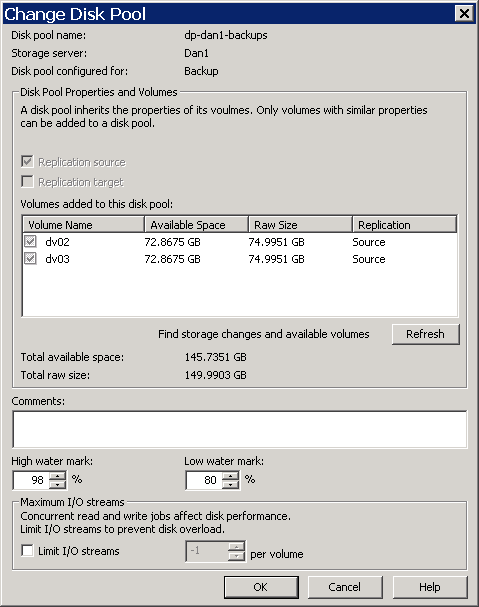 When all volumes in the disk pool reach the High water mark, the disk pool is considered full. NetBackup fails any backup jobs that are assigned to a storage unit in which the disk pool is full. NetBackup also does not assign new jobs to a storage unit in which the disk pool is full. NetBackup begins image cleanup when a volume reaches the High water mark; image cleanup expires the images that are no longer valid. For a disk pool that is full, NetBackup again assigns jobs to the storage unit when image cleanup reduces any disk volume's capacity to less than the High water mark. The default is 98%. Low water mark The Low water mark is a threshold at which NetBackup stops image cleanup. TheLow water mark setting cannot be greater than or equal to the High water mark setting. The default is 80%. Limit I/O streams Select to limit the number of read and write streams (that is, jobs) for each volume in the disk pool. A job may read backup images or write backup images. By default, there is no limit. When the limit is reached, NetBackup chooses another volume for write operations, if available. If not available, NetBackup queues jobs until a volume is available. Too many streams may degrade performance because of disk thrashing. Disk thrashing is excessive swapping of data between RAM and a hard disk drive. Fewer streams can improve throughput, which may increase the number of jobs that complete in a specific time period. per volume Select or enter the number of read and write streams to allow per volume. Many factors affect the optimal number of streams. Factors include but are not limited to disk speed, CPU speed, and the amount of memory. Configuring an OpenStorage storage unit Create one or more storage units that reference each disk pool that you configure. 52 52 Configuring OpenStorage in NetBackup Configuring an OpenStorage storage unit A storage unit inherits the properties of the disk pool. If the storage unit inherits replication properties, the properties signal to a NetBackup storage lifecycle policy the intended purpose of the storage unit and the disk pool. Auto Image Replication requires storage lifecycle policies. Replication properties may not exist or be exposed to NetBackup by the vendor plug-in. See About OpenStorage disk pools for backups on page 19. The Disk Pool Configuration Wizard lets you create a storage unit; therefore, you may have created a storage unit when you created a disk pool. To determine if storage units exist for the disk pool, see the NetBackup Management > Storage > Storage Units window of the NetBackup Administration Console. See About OpenStorage storage unit recommendations on page 56. 54 54 Configuring OpenStorage in NetBackup Configuring an OpenStorage storage unit Table 5-3 OpenStorage storage unit properties Property Storageunitname Storage unit type Disk type Disk pool configured for Replication source Replicationtarget Description Provide a unique name for the new storage unit. The name can describe the type of storage. The storage unit name is the name used to specify a storage unit for policies and schedules. The storage unit name cannot be changed after creation. Select Disk as the storage unit type. Select OpenStorage (Solution) for the disk type. Solution is a string provided by the storage vendor that may represent the vendor, the vendor device, or something else that is meaningful. Select Backup for the disk type. Indicates that the disk pool is a source for replication. If you select this option, NetBackup filters the disk pools to show only those that contain replication source volumes. Indicates that the disk pool is a target for replication. If you select this option, NetBackup filters the disk pools to show only those that contain replication target volumes. Disk pool Select the disk pool that contains the storage for this storage unit. If you select a replication property, NetBackup filters the disk pools that appear in the Disk pool list. Otherwise, all disk pools of the specified Disk type appear If no disk pools are configured, no disk pools appear in the list. After you select a disk pool, you can click View Properties. 56 56 Configuring OpenStorage in NetBackup Configuring an OpenStorage storage unit Table 5-3 OpenStorage storage unit properties (continued) Property Maximum concurrent jobs Description Specify the maximum number of jobs that NetBackup can send to a disk storage unit at one time. (Default: one job. The job count can range from 0 to 256.) NetBackup queues jobs until the storage unit is available. If three backup jobs are ready to be sent to the storage unit and Maximum concurrent jobs is set to two, NetBackup starts the first two jobs. NetBackup queues the third job. If a job contains multiple copies, each copy applies toward the Maximum concurrent jobs count. Maximum concurrent jobs controls the traffic for backup and duplication jobs but not restore jobs. The count applies to all servers in the storage unit, not per server. If you select multiple media servers in the storage unit and 1 for Maximum concurrent jobs, only one job runs at a time. The number to enter depends on the available disk space and the server's ability to run multiple backup processes. Warning: A Maximum concurrent jobs setting of 0 disables the storage unit. About OpenStorage storage unit recommendations You can use storage unit properties to control how NetBackup moves backup and duplication data. For example, you can accomplish the following objectives by using the storage unit Media server setting: Configure a favorable client-to-server ratio for important clients. See About configuring a favorable client-to-server ratio with OpenStorage on page 56. Separate SAN client traffic from other traffic. See About separating OpenStorage SAN client traffic on page 57. You also can use the storage unit Maximum concurrent jobs setting to control the backup or the duplication traffic that is sent to the media servers. See About throttling OpenStorage traffic to the media servers on page 58. About configuring a favorable client-to-server ratio with OpenStorage For a favorable client-to-server ratio, you can use one disk pool and configure multiple storage units to separate your backup traffic. Because all storage units use the same disk pool, you do not have to partition the storage. 57 Configuring OpenStorage in NetBackup Configuring an OpenStorage storage unit 57 For example, assume that you have 100 important clients, 500 regular clients, and four media servers. You can use two media servers to back up your most important clients and two media servers to back up your regular clients. The following example describes how to configure a favorable client-to-server ratio: Configure the media servers for OpenStorage and configure the storage. Configure a disk pool. Configure a storage unit for your most important clients (such as STU-GOLD). Select the disk pool. Select Only use the following media servers. Select two media servers to use for your important backups. Configure a backup policy for the 100 important clients and select the STU-GOLD storage unit. The media servers that are specified in the storage unit move the client data to the storage server. Configure another storage unit (such as STU-SILVER). Select the same disk pool. Select Only use the following media servers. Select the other two media servers. Configure a backup policy for the 500 regular clients and select the STU-SILVER storage unit. The media servers that are specified in the storage unit move the client data to the storage server. Backup traffic is routed to the wanted data movers by the storage unit settings. Note: NetBackup uses storage units for media server selection for write activity (backups and duplications) only. For restores, NetBackup chooses among all media servers that have logon credentials to the storage server. About separating OpenStorage SAN client traffic If you use the NetBackup Fibre Transport option, you can use one disk pool and multiple storage units to manage backup traffic. You can separate the NetBackup SAN client traffic from the regular NetBackup client traffic. Because all storage units use the same disk pool, you do not have to partition the storage. The following example describes how to separate SAN client traffic: Configure the FT media servers and the regular media servers for OpenStorage and configure the storage. Configure a disk pool. 59 Configuring OpenStorage in NetBackup About the storage lifecycle policies required for Auto Image Replication 59 One SLP that contains at least one Backup operation and one Replication operation that is configured to replicate to a target NetBackup domain. (The Auto Image Replication SLP.) In the second, target NetBackup domain: One SLP that contains an Import operation to import the replication. (The Import SLP.) The Import SLP can be configured to create additional copies in that domain or to cascade the copies to another domain. Note: Both SLPs must have identical names. Figure 5-1 shows how the SLP in the target domain is set up to replicate the images from the originating master server domain. Figure 5-1 Storage lifecycle policy pair required for Auto Image Replication SLP on master server in the source domain Replication operation indicates a target master Import Import operation imports copies SLP that imports the copies to the target domain Table 5-4 describes the requirements for each SLP in the pair. 60 60 Configuring OpenStorage in NetBackup About the storage lifecycle policies required for Auto Image Replication Table 5-4 SLP requirements for Auto Image Replication Domain Domain 1 (Originating domain) Storage lifecycle policy requirements The Auto Image Replication SLP must meet the following criteria: The SLP must have the same name as the Import SLP in Domain 2. The SLP must be of the same data classification as the Import SLP in Domain 2. The Backup operation must be to an OpenStorage appliance. Indicate the exact storage unit from the drop-down list. Do not select Any Available. Note: The target domain must contain the same type of storage to import the image. At least one operation must be a Replication operation with the Target master option selected. See Figure 5-2 on page 61. Multiple Replication operations can be configured in an Auto Image Replication SLP. The master server in Domain 1 does not know which target media server will be selected. If multiple SLPs in target domains meet the criteria, NetBackup imports copies in all qualifying domains. Domain 2 The Import SLP must meet the following criteria: (Target domain) The SLP must have the same name as the SLP in Domain 1 described above. The matching name indicates to the SLP which images to process. The SLP must be of the same data classification as the SLP in Domain 1 described above. Matching the data classification keeps a consistent meaning to the classification and facilitates global reporting by data classification. The first operation in the SLP must be an Import operation. Indicate the exact storage unit from the drop-down list. Do not select Any Available. See Figure 5-3 on page 61. The SLP must contain at least one Replication operation that has the Targetretention specified. The following topic describes useful reporting information about Auto Image Replication jobs and import jobs. See Reporting on Auto Image Replication jobs on page 96. 61 Configuring OpenStorage in NetBackup About the storage lifecycle policies required for Auto Image Replication 61 Figure 5-2 Replication operation with Target master option selected in Domain 1 storage lifecycle policy Figure 5-3 Import operation in Domain 2 storage lifecycle policy See Creating a storage lifecycle policy on page 62. Customizing how nbstserv runs duplication and import jobs The NetBackup Storage Lifecycle Manager (nbstserv) runs replication, duplication, and import jobs. Both the Duplication Manager service and the Import Manager service run within nbstserv. The NetBackup administrator can customize how nbstserv runs jobs by adding parameters to the LIFECYCLE_PARAMETERS file. 62 62 Configuring OpenStorage in NetBackup Creating a storage lifecycle policy Creating a storage lifecycle policy A storage lifecycle policy can be selected as the Policy storage within a backup policy. To create a storage lifecycle policy 1 In the NetBackup Administration Console, select NetBackup Management > Storage > Storage Lifecycle Policies. 2 Click Actions > New > Storage Lifecycle Policy (UNIX) or Actions > New > New Storage Lifecycle Policy (Windows). 3 In the New Storage Lifecycle Policy dialog box, enter a Storage lifecycle policy name. 4 Select a Data classification. (Optional.) 5 Select the Priority for secondary operations. This number represents the priority that jobs from secondary operations have in relationship to all other jobs. See Storage Lifecycle Policy dialog box settings on page Click Add to add operations to the SLP. The operations act as instructions for the data. See Adding a storage operation to a storage lifecycle policy on page Click OK to create the storage lifecycle policy. 63 Configuring OpenStorage in NetBackup Creating a storage lifecycle policy 63 Storage Lifecycle Policy dialog box settings A storage lifecycle policy consists of one or more operations. The New Storage Lifecycle dialog box and the Change Storage Lifecycle Policy dialog box contains the following settings. Figure 5-4 Configuration tab of the Storage Lifecycle Policy dialog box Table 5-5 Configuration tab of the Storage Lifecycle Policy dialog box Setting Storage lifecycle policy name Description The Storage lifecycle policy name describes the SLP. The name cannot be modified after the SLP is created. 64 64 Configuring OpenStorage in NetBackup Creating a storage lifecycle policy Table 5-5 Configuration tab of the Storage Lifecycle Policy dialog box (continued) Setting Data classification Description The Data classification defines the level of data that the SLP is allowed to process. The Data classification drop-down menu contains all of the defined classifications. The Data classification is an optional setting. One data classification can be assigned to each SLP and applies to all operations in the SLP. An SLP is not required to have a data classification. If a data classification is selected, the SLP stores only those images from the policies that are set up for that data classification. If no data classification is indicated, the SLP accepts images of any classification or no classification. The Data classification setting allows the NetBackup administrator to classify data based on relative importance. A classification represents a set of backup requirements. When data must meet different backup requirements, consider assigning different classifications. For example, backup data can be assigned to the silver data classification and financial data backup may be assigned to the platinum classification. A backup policy associates backup data with a data classification. Policy data can be stored only in an SLP with the same data classification. Once data is backed up in an SLP, the data is managed according to the SLP configuration. The SLP defines what happens to the data from the initial backup until the last copy of the image has expired. Priority for secondary operations The Priorityforsecondaryoperations setting is the priority that secondary jobs (for example, duplication jobs), have in relationship to all other jobs. Range: 0 (default) to (highest priority). For example, the Priority for secondary operations for a policy with a gold data classification may be set higher than for a policy with a silver data classification. 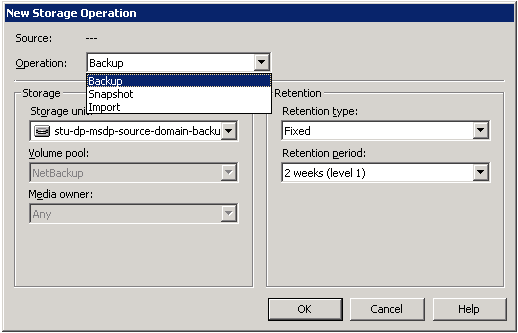 The priority of the backup job is set in the backup policy on the Attributes tab. Operations The Operations list contains all of the operations in the SLP. Multiple operations imply that multiple copies are created. The list also contains the columns that display information about each operation. Note that not all columns display by default. For column descriptions, see the following topic: Suspend secondary operations Enable Suspend secondary operations to stop the operations in the SLP. A selected SLP can also be suspended from the Actions menu and then activated again (Activate). 65 Configuring OpenStorage in NetBackup Creating a storage lifecycle policy 65 Table 5-5 Configuration tab of the Storage Lifecycle Policy dialog box (continued) Setting Validate Across Backup Policies button Description Use this button to see how changes to this SLP can affect the policies that are associated with this SLP. The button generates a report that displays on the Validation Report tab. This button performs the same validation as the -conflict option performs when used with the nbstl command. Arrows Use the arrows to indicate the indentation (or hierarchy) of the source for each copy. One copy can be the source for many other copies. Many operations can be hierarchical or non-hierarchical: Adding a storage operation to a storage lifecycle policy Use the following procedure to add a storage operation to a storage lifecycle policy: To add a storage operation to a lifecycle policy 1 In the NetBackup Administration Console, select NetBackup Management > Storage > Storage Lifecycle Policies. 2 Click Actions > New > New Storage Lifecycle Policy (Windows) or Actions > New > Storage Lifecycle Policy (UNIX). 3 Click Add to add operations to the SLP. The operations are the instructions for the SLP to follow and apply to the data that is eventually specified in the backup policy. To create a hierarchical SLP, select an operation to become the source of the next operation, then click Add. 67 Configuring OpenStorage in NetBackup Creating a policy using the Policy Configuration Wizard 67 Maximum snapshot limit Mirror Target retention 9 Indicate an Alternate read server that is allowed to read a backup image originally written by a different media server. 10 Click OK to create the storage operation. Creating a policy using the Policy Configuration Wizard The easiest method to set up a backup policy is to use the Policy Configuration Wizard. This wizard guides you through the setup process by automatically choosing the best values for most configurations. Not all policy configuration options are presented through the wizard. For example, calendar-based scheduling and the Data Classification setting. After the policy is created, modify the policy in the Policies utility to configure the options that are not part of the wizard. Use the following procedure to create a policy using the Policy Configuration Wizard. To create a policy with the Policy Configuration Wizard 1 In the NetBackup Administration Console, in the left pane, click NetBackup Management. 2 In the right pane, click Create a Policy to begin the Policy Configuration Wizard. 3 Select File systems, databases, or applications. 4 Click Next to start the wizard and follow the prompts. Click Help on any wizard panel for assistance while running the wizard. Creating a policy without using the Policy Configuration Wizard Use the following procedure to create a policy without using the Policy Configuration Wizard. 68 68 Configuring OpenStorage in NetBackup Configuring OpenStorage optimized duplication behavior To create a policy without the Policy Configuration Wizard 1 In the NetBackup Administration Console, in the left pane, expand NetBackup Management > Policies. 2 Type a unique name for the new policy in the Add a New Policy dialog box. 3 If necessary, clear the Use Policy Configuration Wizard checkbox. 4 Click OK. 5 Configure the attributes, the schedules, the clients, and the backup selections for the new policy. Configuring OpenStorage optimized duplication behavior You can configure the following optimized duplication behaviors: Optimized duplication failover By default, if an optimized duplication job fails, NetBackup does not run the job again. You can configure NetBackup to use normal duplication if an optimized duplication fails. See To configure optimized duplication failover on page 69. Number of optimized duplication attempts By default, NetBackup tries an optimized duplication job three times before it fails the job. You can change the number of times NetBackup retries an optimized duplication job before it fails the jobs. See To configure the number of duplication attempts on page 69. Storage lifecycle policy retry wait period If a storage lifecycle policy optimized duplication job fails, NetBackup waits two hours and then retries the job. By default, NetBackup tries a job three times before the job fails. You can change the number of hours for the wait period. See To configure the storage lifecycle policy wait period on page 69. Caution: These settings affect all optimized duplication jobs; they are not limited to OpenStorage optimized duplication. 69 Configuring OpenStorage in NetBackup Configuring OpenStorage optimized duplication within the same domain 69 To configure optimized duplication failover On the master server, add the following configuration option: RESUME_ORIG_DUP_ON_OPT_DUP_FAIL = TRUE See Setting NetBackup configuration options by using bpsetconfig on page 74. Alternatively on UNIX systems, add the entry to the bp.conf file on the NetBackup master server. To configure the number of duplication attempts Create a file named OPT_DUP_BUSY_RETRY_LIMIT that contains an integer that specifies the number of times to retry the job before NetBackup fails the job. The file must reside on the master server in the following directory (depending on the operating system): UNIX: /usr/openv/netbackup/db/config Windows: install_path\netbackup\db\config. To configure the storage lifecycle policy wait period Change the wait period for retries by adding an IMAGE_EXTENDED_RETRY_PERIOD_IN_HOURS entry to the NetBackup LIFECYCLE_PARAMETERS file. The default for this value is two hours. For example, the following entry configures NetBackup to wait four hours before NetBackup tries the job again: IMAGE_EXTENDED_RETRY_PERIOD_IN_HOURS 4 The LIFECYCLE_PARAMETERS file resides in the following directories: UNIX: /usr/openv/netbackup/db/config Windows: install_path\netbackup\db\config. Configuring OpenStorage optimized duplication within the same domain You can configure optimized duplication from one disk appliance to another. A NetBackup media server initiates and manages the duplication between appliances. After the duplication completes, the media server connects to the destination appliance to verify the image copy. NetBackup maintains records of the image copies and their locations in the NetBackup catalog. See About optimized duplication within the same domain on page 21. 70 70 Configuring OpenStorage in NetBackup Configuring OpenStorage optimized duplication within the same domain To configure optimized duplication 1 Ensure that all requirements are met. See About optimized duplication within the same domain on page Configure optimized duplication behaviors. See Configuring OpenStorage optimized duplication behavior on page 68. See About throttling OpenStorage traffic to the media servers on page Select the media server in common. In the storage unit for the destination disk pool, select Only use the following media servers. Then, select the media server or media servers that are common to both the source storage server and the destination storage server. If you select more than one, NetBackup balances the optimized copy job load among them. 4 Use one of the following methods to duplicate backup images: A storage lifecycle policy. The storage lifecycle policy manages both the backup jobs and the duplication jobs. When you configure the storage lifecycle policy, do the following: For the Backup destination, select the Storage unit that is the target of your backups. The disk appliance for the storage unit contains the primary backup copies; they are the source images for the duplication operation. For the Duplication destination, select the Storage unit for the disk pool on another appliance. See Creating a storage lifecycle policy on page 62. A Vault policy. For Vault, you must configure a Vault profile and a Vault policy. On the Vault Profile dialog box ChooseBackups tab, choose the backup images in the source disk pool. On the Vault Profile dialog box Duplication tab, select the destination storage unit in the Destination Storage unit field. 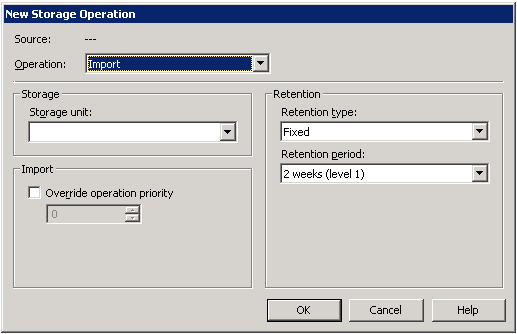 Configure a Vault policy to schedule the duplication jobs. A Vault policy is a NetBackup policy that is configured to run Vault jobs. Select the profile you created for the OpenStorage duplication job. See the NetBackup Vault Administrator s Guide. The bpduplicate command. Use the NetBackup bpduplicate command to copy images manually. 71 Configuring OpenStorage in NetBackup Configuring OpenStorage direct to tape 71 Duplicate from the source storage to the destination storage. See NetBackup Commands Reference Guide. You can apply separate retention periods to each copy. For example, you can retain the source image for three weeks and the destination copy for a longer period of time. If you delete the source image, the copy is not deleted. Configuring OpenStorage direct to tape To configure OpenStorage direct to tape, you must perform multiple procedures on multiple computers. These procedures are in addition to the procedures to install and configure the disk appliance and OpenStorage. See About OpenStorage direct to tape on page 28. Table 5-6 OpenStorage direct to tape configuration overview Step Step 1 Step 2 Step 3 Step 4 Action Install and configure the NDMP tape server hosts and storage devices Reconfigure the storage server Install the NetBackup for NDMP software Configure NDMP host credentials Description See the NetBackup for NDMP Administrator s Guide. If you upgraded a disk appliance so it supports the Symantec OpenStorage copy to tape specification, you must reconfigure the storage server in NetBackup. See Configuring an OpenStorage storage server for backups on page 44. Install the NetBackup for NDMP software on each media server you use for direct to tape. See About media server requirements for OpenStorage direct to tape on page 31. See About media server recommendations for OpenStorage direct to tape on page 31. See the NetBackup for NDMP Administrator s Guide. You must enter a license key that activates NDMP on those media servers. The license key that activates OpenStorage also activates NetBackup for NDMP. Configure logon credentials in NetBackup for the NDMP hosts. See About NDMP requirements for OpenStorage direct to tape on page 29. See the NetBackup for NDMP Administrator s Guide. 72 72 Configuring OpenStorage in NetBackup Configuring OpenStorage direct to tape Table 5-6 OpenStorage direct to tape configuration overview (continued) Step Step 5 Step 6 Action Configure the NetBackup storage units Configure the copy to tape process Description The storage units must be configured as NDMP storage units, and they must use the NDMP tape storage as their destination. You do not have to include the write side media servers explicitly in the storage unit. If you configure AnyAvailable, when the job runs NetBackup selects a media server that has the logon credentials for the NDMP tape server. See the NetBackup Administrator's Guide for UNIX and Linux, Volume I or the NetBackup Administrator's Guide for Windows, Volume I. First ensure that all requirements are met. See About NDMP requirements for OpenStorage direct to tape on page 29. Then, use one of the following methods for direct to tape: Create a storage lifecycle policy to create the backup and to duplicate the backup images automatically. For the Backup destination Storage unit, select the storage unit for the disk pool on one appliance. For the Duplication destination Storage unit, select the NDMP storage unit. See the NetBackup Administrator s Guide for UNIX and Linux, Volume I or the NetBackup Administrator's Guide for Windows, Volume I. Create a Vault policy to copy images automatically. On the Profile dialog box ChooseBackups tab, choose the backup images in the source disk pool on one appliance. For the Destination Storage unit on the Duplication tab, select the NDMP storage unit. See the NetBackup Vault Administrator s Guide. Use the Duplicate option in the Catalog node of the NetBackup Administration Console. Select the NDMP storage unit as the destination for the duplication. Use the Storage unit field in the Setup Duplication Variables dialog box. See the NetBackup Administrator s Guide for UNIX and Linux, Volume I or the NetBackup Administrator's Guide for Windows, Volume I. Use the NetBackup bpduplicate command to duplicate images on the disk appliance to an NDMP storage unit. See NetBackup Commands Reference Guide..
73 Configuring OpenStorage in NetBackup Configuring OpenStorage optimized synthetic backups 73 Configuring OpenStorage optimized synthetic backups Use the following procedure to configure optimized synthetic backups. If NetBackup cannot produce the optimized synthetic backup, NetBackup creates the more data-movement intensive synthetic backup. See About OpenStorage optimized synthetic backups on page 27. To configure optimized synthetic backup 1 Configure a Standard or MS-Windows backup policy. 2 Select the Synthetic backup attribute on the Schedule Attribute tab. Adding OpenStorage functionality to an existing environment Your OpenStorage vendor may update their plug-in to expose more functionality on their disk appliance. For example, the vendor may update their plug-in to support optimized synthetic backups. If the vendor provides an updated plug-in, you must complete the following procedures to integrate the new functionality into NetBackup. Table 5-7 Task Overview of how to add OpenStorage functionality Procedure Install the updated plug-in Update the storage server See Installing the disk appliance plug-in on page 36. You must update the storage server so NetBackup can use the new functionality. See Updating an OpenStorage storage server to reflect plug-in updates on page 78. Update existing disk pools You also must update existing disk pools so they recognize the new functionality. See Updating an OpenStorage disk pool to reflect plug-in updates on page 93. Any disk pools that you create after you update the vendor plug-in and storage server inherit the new functionality. 75 Chapter 6 Managing OpenStorage This chapter includes the following topics: Managing OpenStorage storage servers Managing OpenStorage server credentials Managing OpenStorage data movers Managing OpenStorage disk pools Monitoring OpenStorage storage capacity and usage Viewing OpenStorage disk reports Reporting on Auto Image Replication jobs About catalog backups to OpenStorage devices About restoring from backup copies About restoring from a backup at a target master domain Managing OpenStorage storage servers After you configure OpenStorage, you can perform various tasks to manage storage servers. See Changing OpenStorage storage server properties on page 76. See Deleting an OpenStorage storage server on page 76. See Determining OpenStorage storage server state on page 77. See Removing OpenStorage storage server attributes on page 78. See Setting OpenStorage storage server attributes on page 77. 76 76 Managing OpenStorage Managing OpenStorage storage servers See Updating an OpenStorage storage server to reflect plug-in updates on page 78. See Viewing OpenStorage storage servers on page 79. Changing OpenStorage storage server properties You can change the OpenStorage storage server properties. The storage vendor exposes the properties that you can change. See About OpenStorage storage servers for backups on page 17. To change deduplication storage server properties 1 In the NetBackup Administration Console, expand Media and Device Management > Credentials > Storage Server 2 Select the storage server. 3 On the Edit menu, select Change. 4 In the Change Storage Server dialog box, select the Properties tab. 5 To change a value, select it in the Value column and then change the value. 6 When finished changing values, click OK. 7 Click OK. Deleting an OpenStorage storage server If you delete a storage server, NetBackup removes it from your configuration. Warning: Do not delete a storage server if the storage that it manages contains unexpired NetBackup images. To delete an OpenStorage storage server 1 If the storage server currently manages volumes, perform the following tasks: Expire the the images on the volumes. Warning: If unexpired images are deleted, data loss may occur. Delete the storage units that comprise the disk pools. 78 78 Managing OpenStorage Managing OpenStorage storage servers For hostname, use the name of the disk appliance host. For server_type, the OpenStorage vendor provides the string that identifies their storage type. For attribute, use the name of the attribute you want to set. The following is the path to the nbdevconfig command: UNIX: /usr/openv/netbackup/bin/admincmd Windows: install_path\netbackup\bin\admincmd Removing OpenStorage storage server attributes You may have to remove attributes from your storage server. Usually, you remove attributes to change or remove functionality. If you remove attributes on the storage server, you also must remove the same attributes on the existing disk pools. Any disk pools that you create after you update the storage server inherit the storage server functionality. To remove an OpenStorage storage server attribute Run the following command on the NetBackup master server or on a storage server: nbdevconfig -changests -storage_server hostname -stype server_type -clearattribute attribute For hostname, use the name of the disk appliance host. For server_type, the OpenStorage vendor provides the string that identifies their storage type. For attribute, use the name of the attribute you want to clear. The following is the path to the nbdevconfig command: UNIX: /usr/openv/netbackup/bin/admincmd Windows: install_path\netbackup\bin\admincmd Updating an OpenStorage storage server to reflect plug-in updates If an OpenStorage partner updates their plug-in, update the NetBackup storage server to reflect the new functionality of the plug-in. After you update the storage server, also update any existing disk pools. See Updating an OpenStorage disk pool to reflect plug-in updates on page 93. 79 Managing OpenStorage Managing OpenStorage storage servers 79 To update an OpenStorage storage server from the NetBackup Administration Console 1 In the NetBackup Administration Console, expand Media and Device Management > Credentials > Storage Servers. 2 In the right pane, right-click the storage server. 3 Select Update Storage Server Details. 4 Update the existing disk pools so that each can use the new functionality. Any disk pools that were created after the storage server is updated inherit the new functionality. To update an OpenStorage storage server from the command line 1 Run the following command on the master server or on one of the media servers: nbdevconfig -updatests -storage_server storage_server -stypeserver_type -media_server media_server The following is the path to the nbdevconfig command: UNIX: /usr/openv/netbackup/bin/admincmd Windows: install_path\netbackup\bin\admincmd See the following descriptions of the options that require arguments: -storage_server storage_server -stype server_type -media_server media_server The name of the disk appliance. The storage vendor provides the string that identifies the server type. A NetBackup media server that connects to the storage server. The media server queries the storage server for its capabilities. The vendor plug-in must be installed on the media server. If the plug-in resides on more than one media server, you can specify any one of them. 2 Update the existing disk pools so that each can use the new functionality. Any disk pools that were created after the storage server is updated inherit the new functionality. Viewing OpenStorage storage servers Use the NetBackup Administration Console to view a list of storage servers already configured. 80 80 Managing OpenStorage Managing OpenStorage server credentials To view OpenStorage storage servers In the NetBackup Administration Console, in the left pane, expand Media and Device Management > Credentials > Storage Server. The right All Storage Servers pane shows all configured storage servers. OpenStorage storage servers show the vendor string that identifies the storage type in the Disk Type column. Managing OpenStorage server credentials You can perform various tasks to manage existing credentials in NetBackup. See Adding OpenStorage server credentials on page 80. See Changing OpenStorage server credentials on page 80. See Deleting the OpenStorage server credentials of a data mover on page 81. See Determining if OpenStorage server credentials exist on page 81. Adding OpenStorage server credentials You can add a media server as a data mover to your OpenStorage configuration. If you do, you must add the storage server credentials to that media server. See Adding an OpenStorage data mover on page 82. To add OpenStorage server credentials 1 In the NetBackup Administration Console, expand Media and Device Management > Credentials > Storage Servers. 2 Select the storage server, then select Edit > Change. 3 Select the Media Servers tab. 4 Select the server you want to add. Also ensure that any servers already credentialed are selected. 5 Enter the credentials. 6 Click Set and then click OK. Changing OpenStorage server credentials You can change the credentials that the media servers that function as data movers use. The credentials are for the storage server. See About OpenStorage server credentials on page 17. 81 Managing OpenStorage Managing OpenStorage server credentials 81 To change OpenStorage server credentials 1 In the NetBackup Administration Console, expand Media and Device Management > Credentials > Storage Server. 2 Select the storage server, then select Edit > Change. 3 Select the Media Servers tab. 4 Select the media servers that function as data movers. 5 Change the credentials. 6 Click Set and then click OK. Deleting the OpenStorage server credentials of a data mover If you remove a media server as a data mover, you must delete the storage server credentials of the media server. If the host failed and is unavailable, you can use the tpconfig device configuration utility in menu mode to delete the credentials. However, you must run the tpconfig utility on a UNIX or Linux NetBackup server. For procedures, see the NetBackup Administrator s Guide for UNIX and Linux, Volume II. To delete OpenStorage server credentials of a data mover 1 In the NetBackup Administration Console, expand Media and Device Management > Credentials > Storage Server. 2 Select the storage server, then select Edit > Change. 3 Select the Media Servers tab. 4 Select the media server for which you want to delete the credentials. 5 Click Remove and then click OK. Determining if OpenStorage server credentials exist You can determine which media servers have credentials configured for the atorage server. 82 82 Managing OpenStorage Managing OpenStorage data movers To determine if the storage server credentials are configured already 1 In the NetBackup Administration Console, expand Media and Device Management > Credentials > Storage Server. 2 Select the storage server, then select Edit > Change. 3 Select the Media Servers tab. The media servers for which credentials are configured are identified in the Media Servers Status column. Managing OpenStorage data movers In OpenStorage, NetBackup media servers function as the data movers. A data mover is an entity that moves data between the primary storage (the NetBackup client) and the storage server. For an existing OpenStorage environment in NetBackup, you can do the following: Add a media server as a data mover. See Adding an OpenStorage data mover on page 82. To add an OpenStorage data mover, see the procedure later in this section. Retire a media server as a data mover. See Retiring an OpenStorage data mover on page 83. See About OpenStorage data movers for backups on page 18. Adding an OpenStorage data mover Use the following process to add an OpenStorage data mover. Table 6-1 Process to add an OpenStorage data mover Step Step 1 Step 2 Step 3 Step 4 Task Install and configure the NetBackup media server software. For disk appliance storage, install the OpenStorage vendor software plug-in on the media server For disk appliance storage, connect the NetBackup media server to the OpenStorage appliance. Add the storage server logon credentials for the media server. Description See the NetBackup Installation Guide for UNIX and Linux or the NetBackup Installation Guide for Windows. See Installing the disk appliance plug-in on page 36. Beyond the scope of the NetBackup documentation. See Adding OpenStorage server credentials on page 80. 83 Managing OpenStorage Managing OpenStorage disk pools 83 Table 6-1 Process to add an OpenStorage data mover (continued) Step Task Description Step 5 For every storage unit that points to a disk pool of that storage server, verify that the new media server appears. The storage unit dialog box includes a media servers list. In the NetBackup Administration Console, in the left pane, select NetBackupManagement>Storage > Storage Units. For every storage unit that is configured to use any available media server, the new data mover is allowed access to the storage server automatically. Step 6 For every storage unit that specifies Use one of the followingmediaservers, update the storage unit so it uses the correct data movers. In the NetBackup Administration Console, in the left pane, select NetBackupManagement>Storage > Storage Units. This step is not required if the storage unit is configured to use any available media server. Retiring an OpenStorage data mover Use the following process to retire an OpenStorage data mover. Table 6-2 What Process to retire an OpenStorage data mover Where For every NetBackup storage unit that specifies that data mover (that is, media server), clear the checkbox that specifies the media server. This step is not required if the storage unit is configured to use any available media server. See the NetBackup Installation Guide for UNIX and Linux or the NetBackup Installation Guide for Windows. On the media server to be retired, delete the credentials for the storage server. See Deleting the OpenStorage server credentials of a data mover on page 81. Managing OpenStorage disk pools After you configure OpenStorage, you can perform various tasks to manage your OpenStorage disk pools. See Adding volumes to an OpenStorage disk pool on page 84. See Changing OpenStorage disk pool properties on page 85. 84 84 Managing OpenStorage Managing OpenStorage disk pools See Changing OpenStorage disk pool state on page 89. See Changing OpenStorage disk volume state on page 90. See Deleting an OpenStorage disk pool on page 90. See Determining OpenStorage disk pool state on page 91. See Determining OpenStorage disk volume state on page 91. See Merging OpenStorage disk pools on page 92. See Removing a volume from an OpenStorage disk pool on page 93. See Updating an OpenStorage disk pool to reflect plug-in updates on page 93. See Viewing OpenStorage disk pools on page 94. Adding volumes to an OpenStorage disk pool If you add disk volumes to the storage appliance, NetBackup does not add those volumes to an OpenStorage disk pool automatically. To use the additional disk volumes in an existing disk pool, you must add those volumes to the disk pool. (By default, NetBackup automatically increases disk pool capacity if the capacity of the underlying disk volumes increases. Similarly, NetBackup decreases the capacity of a disk pool if the underlying disk volume capacity decreases.) The NetBackup storage units that use the disk pool automatically use the additional storage capacity. You do not have to change the storage units. You also can add volumes by using the Change Disk Pool dialog box. See Changing OpenStorage disk pool properties on page 85. Table 6-3 Task Add volumes process for OpenStorage disk pool Procedure Configure a disk pool from the new disk volumes on the storage server. Merge the disk pools. When you merge the disk pools, specify the original disk pool as the primary one. NetBackup deletes the secondary disk pool after the merge. See Configuring an OpenStorage disk pool for backups on page 50. See Merging OpenStorage disk pools on page 92. 85 Managing OpenStorage Managing OpenStorage disk pools 85 Changing OpenStorage disk pool properties You can change the properties of a disk pool and manage the topology of existing volumes that have replication properties. If NetBackup discovers new volumes that match the replication properties of the disk pool, you can add those volumes. Another method exists to add volumes to a disk pool. See Adding volumes to an OpenStorage disk pool on page 84. To change OpenStorage disk pool properties 1 In the NetBackup Administration Console, in the left pane, expand Media and Device Management > Devices > Disk Pools. 2 In the right pane, select the disk pool you want to change. 3 Click Edit > Change. 86 86 Managing OpenStorage Managing OpenStorage disk pools 4 To query the storage server for disk volume changes, click Refresh in the Change Disk Pool dialog box. If NetBackup discovers changes, your actions depend on the changes discovered. See How to resolve volume changes for Auto Image Replication on page Change the other properties as necessary. See OpenStorage disk pool properties on page Click OK. How to resolve volume changes for Auto Image Replication When you open the Change Disk Pool dialog box, NetBackup loads the disk pool properties from the catalog. NetBackup only queries the storage server for changes when you click the Refresh in the Change Disk Pool dialog box. Symantec recommends that you take the following actions when the volume topology change: Discuss the changes with the storage administrator. You need to understand the changes so you can change your disk pools (if required) so that NetBackup can continue to use them. If the changes were not planned for NetBackup, request that the changes be reverted so that NetBackup functions correctly again. NetBackup can process changes to the following volume properties: Replication Source Replication Target None If these volume properties change, NetBackup can update the disk pool to match the changes. NetBackup can continue to use the disk pool, although the disk pool may no longer match the storage unit or storage lifecycle purpose. Table 6-4 describes the possible outcomes and describes how to resolve them. Table 6-4 Refresh outcomes Outcome No changes are discovered. Description No changes are required. NetBackup discovers the new volumes that you can add to the disk pool. The new volumes appear in the Change Disk Pool dialog box. 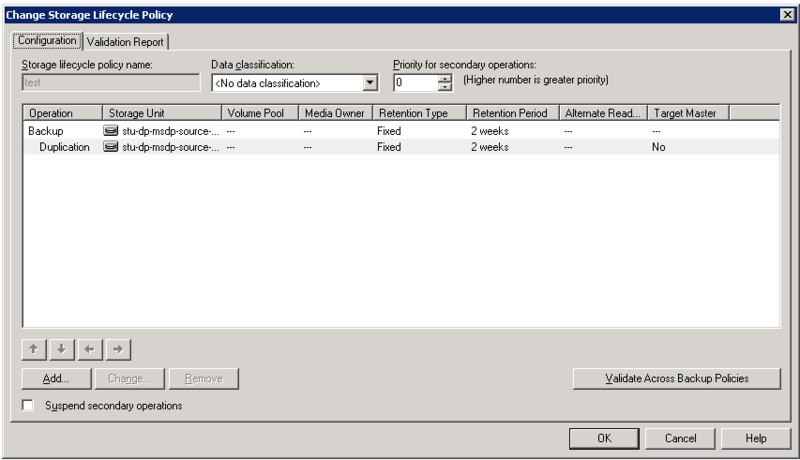 Text in the dialog box changes to indicate that you can add the new volumes to the disk pool. 87 Managing OpenStorage Managing OpenStorage disk pools 87 Table 6-4 Refresh outcomes (continued) Outcome Description The replication properties of all of the volumes changed, but they are still consistent. A Disk Pool Configuration Alert pop-up box notifies you that the properties of all of the volumes in the disk pool changed, but they are all the same (homogeneous). 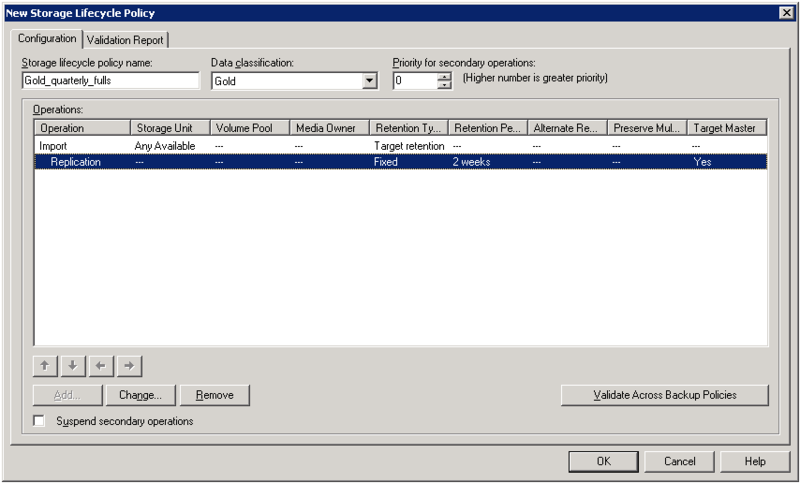 You must click OK in the alert box, after which the disk pool properties in the Change Disk Pool dialog box are updated to match the new volume properties. If new volumes are available that match the new properties, NetBackup displays those volumes in the Change Disk Pool dialog box. You can add those new volumes to the disk pool. In the Change Disk Pool dialog box, select one of the following two choices: OK. To accept the disk pool changes, click OK in the Change Disk Pool dialog box. NetBackup saves the new properties of the disk pool. NetBackup can use the disk pool, but it may no longer match the intended purpose of the storage unit or storage lifecycle policy. Change the storage lifecycle policy definitions to ensure that the replication operations use the correct source and target disk pools, storage units, and storage unit groups. Alternatively, work with your storage administrator to change the volume properties back to their original values. Cancel. To discard the changes, click Cancel in the Change Disk Pool dialog box. NetBackup does not save the new disk pool properties. NetBackup can use the disk pool, but it may no longer match the intended use of the storage unit or storage lifecycle policy. 88 88 Managing OpenStorage Managing OpenStorage disk pools Table 6-4 Refresh outcomes (continued) Outcome The replication properties of the volumes changed, and they are now inconsistent. Description A DiskPoolConfigurationError pop-up box notifies you that the replication properties of some of the volumes in the disk pool changed. The properties of the volumes in the disk pool are not homogeneous. You must click OK in the alert box. In the Change Disk Pool dialog box, the properties of the disk pool are unchanged, and you cannot select them (that is, they are dimmed). However, the properties of the individual volumes are updated. Because the volume properties are not homogeneous, NetBackup cannot use the disk pool until the storage configuration is fixed. NetBackup does not display new volumes (if available) because the volumes already in the disk pool are not homogeneous. To determine what has changed, compare the disk pool properties to the volume properties. See Viewing the replication topology for Auto Image Replication on page 46. Work with your storage administrator to change the volume properties back to their original values. The disk pool remains unusable until the properties of the volumes in the disk pool are homogenous. In the Change Disk Pool dialog box, click OK or Cancel to exit the Change Disk Pool dialog box. 89 Managing OpenStorage Managing OpenStorage disk pools 89 Table 6-4 Refresh outcomes (continued) Outcome Description NetBackup cannot find a volume or volumes that were in the disk pool. A Disk Pool Configuration Alert pop-up box notifies you that an existing volume or volumes was deleted from the storage device: NetBackup can use the disk pool, but data may be lost. To protect against accidental data loss, NetBackup does not allow volumes to be deleted from a disk pool. To continue to use the disk pool, do the following: Use the bpimmedia command or the Images on Disk report to display the images on the specific volume. Expire the images on the volume. Use the nbdevconfig command to set the volume state to DOWN so NetBackup does not try to use it. Changing OpenStorage disk pool state Disk pool state is UP or DOWN. To change the state to DOWN, the disk pool must not be busy. If backup jobs are assigned to the disk pool, the state change fails. Cancel the backup jobs or wait until the jobs complete. To change OpenStorage disk pool state 1 In the NetBackup Administration Console, in the left pane, select Media and Device Management > Device Monitor. 2 At the bottom of the right pane, select the Disk Pools tab. 3 Select the disk pool. 4 Select either Actions > Up or Actions > Down. Symantec Mobile Encryption for ios User's Guide The software described in this book is furnished under a license agreement and may be used only in accordance with the terms of the agreement. Version 2.0.0.